Use the seven-step inspection procedure described in Section 2 to inspect your combination vehicle. There are more things to inspect on a combination vehicle than on a single vehicle. (For example, tires, wheels, lights, reflectors, etc.) However, there are also some new things to check. These are discussed below. Do these checks in addition to those already listed in Section 2. No missing or damaged parts. No visible space between upper and lower fifth wheel. 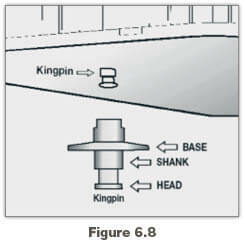 Locking jaws around the shank, not the head of kingpin. See Figure 6.8. Release arm properly seated and safety latch/lock engaged. Glide plate securely mounted to trailer frame. Air and electric lines to trailer. Electrical cord firmly plugged in and secured. Air lines properly connected to glad hands, no air leaks, properly secured with enough slack for turns. All lines free from damage. Slide not damaged or parts missing. All locking pins present and locked in place. If air powered–no air leaks. Check that fifth wheel is not so far forward that tractor frame will hit landing gear, or the cab hit the trailer, during turns. Fully raised, no missing parts, not bent or otherwise damaged. Crank handle in place and secured. If power operated, no air or hydraulic leaks. Do these checks in addition to Section 5.3: Inspecting Air Brake Systems. The following section explains how to check air brakes on combination vehicles. Check the brakes on a double or triple trailer as you would any combination vehicle. Check That Air Flows to All Trailers. Use the tractor parking brake and/or chock the wheels to hold the vehicle. Wait for air pressure to reach normal, then push in the red “trailer air supply” knob. This will supply air to the emergency (supply) lines. Use the trailer handbrake to provide air to the service line. Go to the rear of the rig. Open the emergency line shut-off valve at the rear of the last trailer. You should hear air escaping, showing the entire system is charged. Close the emergency line valve. Open the service line valve to check that service pressure goes through all the trailers (this test assumes that the trailer handbrake or the service brake pedal is on), and then close the valve. If you do NOT hear air escaping from both lines, check that the shut-off valves on the trailer(s) and dolly(ies) are in the OPEN position. You MUST have air all the way to the back for all the brakes to work. If the tractor protection valve doesn’t work right, an air hose or trailer brake leak could drain all the air from the tractor. This would cause the emergency brakes to come on, with possible loss of control. Test Trailer Emergency Brakes. Charge the trailer air brake system and check that the trailer rolls freely. Then stop and pull out the trailer air supply control (also called tractor protection valve control or trailer emergency valve), or place it in the “emergency” position. Pull gently on the trailer with the tractor to check that the trailer emergency brakes are on.